1 French Connection. 2 Chanel. 3 Stella and Dot. 4 Forever 21. 5 BCBG. 6 Bijoux Heart. 7 Topshop. 8 Banana Republic. 9 AllSaints. 10 Aldo. 11 Lanvin. The bloggers above are wearing the under the sea trend quite literally and with bold prints in effect you can. If being splashed from head to toe in sea creatures freaks you out you can still pull off this trend in a less dramatic way. In order to do that just stick with accessories telling the under water story. 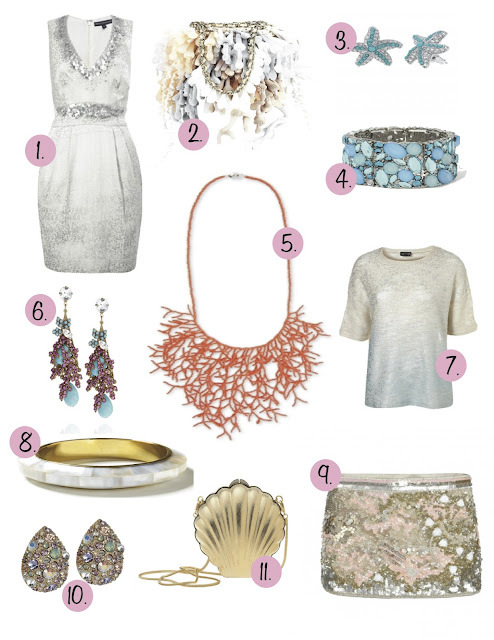 Whether you are wearing a necklace with a starfish charm or a bracelet clustered with ocean hue gems it all still works. As for clothing, instead of wearing a print think about wearing colours like blue, green and coral. With pastels everywhere this shouldn't be difficult to find. To spice up your look just a little bit further add a metallic piece like maybe a silver skirt or a pair of shorts. Think about the beauty inside a clam shell - shiny, eye-catching and beautiful soft colours. Will you be trying out an under the sea look? What an amazing dress ~! I really love the color and the way you styled up~!